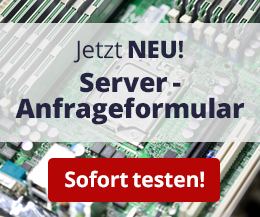 Please use our Server Configurator. As a distributor, we work independently with renowned component manufacturers such as Supermicro, Intel, Adaptec and ATP. We can consistently assure high quality and availability of our products and recommend optimal server hardware & software as well as spare parts. Processors, motherboards, hard drives, RAM, power supplies etc. Finding instead of searching! As a solution provider, we provide you with individual and complete IT-solutions from consulting to the commissioning. Do you need a completely new solution, consolidation or extension of your IT-landscape? Many years of experience and ongoing training are key to successful projects - cost effective and sustainable. Clusters, virtualization and storage solutions for your server room! A wide range of different services allows to customize individual service packages to your requirements. You decide which possibilities you will use on which extent. Further more we offer all technologies at fair conditions. Inform yourself about leasing or the optional rebuy by us. We offer you the unique "Buffer Stock Solutions" and "Life Cycle Plus" solutions, as well as the failure early detection service. Please note that we are only sell to companies within the meaning of ï¿½ 14 BGB. Still no customer? register now! Please use the print function of the page to print or save the offer as PDF document with correct VAT and shipping costs.